there’s been a lot of buzz lately dealing with building integrated renewable resources such as solar and wind. these are both phenomenal ideas that lead to far fewer emissions, less reliance on commercially generated energy, and economic savings. advances in the fields of wind technology and photovoltaics are happening at a staggering pace as of late. one of my favorite new technologies is the photovoltaic film in which pv cells are literally printed on flexible materials and are relatively transparent. this means such films can be overlaid on almost any surface turning any window or roof into a solar power generating unit without spending large amounts of money and resources to grow the ultra-high quality silcon wafers normally required for pv cells. 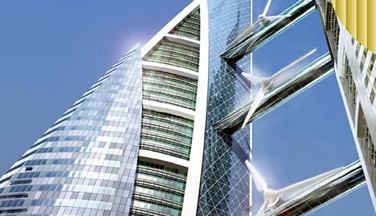 according to treehugger this morning a high-rise building in bahrain, the bahrain world trade center, has just installed wind turbines making it the first structure to make use of building integrated wind turbines in the world. while i’ve seen a great number of academic proposals and schemes for such technology and a number of real projects on the drawing boards as of late (including som’s pearl river tower in guandong, china as seen below), this is the first building to actually use biwt, granted, in this case, it’s a retrofit. nonetheless the added turbines are expected to generate 11-15% of the buildings required energy while eliminating the production of some 55,000 kilograms of carbon dioxide emissions. 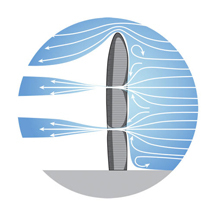 positioning of the turbines was done in such a way to maximize wind speed through the rotors using the bernoulli principle, which is, in effect, the idea that forcing the same amount of air through a smaller space (the area between the twin towers) actually increases the wind speed thus creating more potential energy (see below). additionally, the turbines have been oriented to face the prevailing gulf winds. i for one am ecstatic that this technology is finally being integrated. it will be a great day when we can reduce every building’s emissions to zero and have the capability for them to be 100% sustainable and self-sufficient in terms of energy demands.